The All-In-One Wyoming Labor Law Poster is a general labor law poster poster by the Wyoming Department Of Workforce Services. This is a mandatory posting for all employers in Wyoming, and businesses who fail to comply may be subject to fines or sanctions. This Wyoming Department of Workforce Services packet contains all necessary and recommended posters specific to Wyoming for employers and employees operating in the State. WY All-In-One Labor Poster: Instead of printing out dozens of posters, employers can also purchase an all-in-one poster that covers both Wyoming and Federal poster requirements by clicking here . It appears you don't have a PDF plugin for this browser. Please see the link below to download wyoming-labor-law-wyoming.pdf. as authorized by the Act. By law: Safety on the job is everybody’s responsibility! ble to their own action and conduct. and losses of an eye within 24 hours. period within which the violation must be corrected. days, whichever period is longer. ties for each non-serious or regulatory violation(s). the period set for correction in the notice of violation. illness, without being retaliated against .  File a complaint with OSHA within 30 days (by  phone, online or by mail) if you have been retaliat- ed against for using your rights.  See any OSHA citations issued to your employer. place injury and illness log.  Comply with all applicable OSHA standards.  Provide require training to all workers in a language  and vocabulary they can understand.  Prominently display this poster in the workplace. all the citations are abated. Denver, CO 80202-5716, Phone: (303) 844-1600. Internet. Unemployment insurance taxes are paid by employers. conspicuous location accessible  to all employees. hazardous industries may opt for this coverage level, as well. 72 hours of the incident. or where to obtain an injury report form. 777-7441 or visit wyomingworkforce.org . There are an additional 0 optional and mandatory Wyoming labor law posters that may be relevant to your business. Be sure to also print all relevant state labor law posters, as well as all mandatory federal labor law posters. 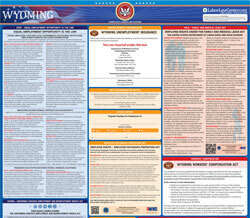 Instead of printing out pages of mandatory Wyoming and Federal labor law posters, you can purchase a professional, laminated all-in-one labor law poster that guarantees compliance with all Wyoming and federal posting requirements. Fully updated for 2019! While we do our best to keep our list of Wyoming labor law posters up to date and complete, we cannot be held liable for errors or omissions. Is the poster on this page out-of-date or not working? Please let us know and we will fix it ASAP. LaborPosters.org will email you a printable PDF of this Wyoming labor law poster, 100% FREE. You'll also get notified when new posters are available. Your Wyoming poster has been downloaded and emailed! This poster download is provided as-is, with no warranty or guarantees. Please verify with Federal and Wyoming authorities to confirm that you are posting all of the correct (and updated) posters required for your type of business. Instead of printing out pages of mandatory Wyoming and Federal labor law posters, you can purchase a professional, laminated all-in-one labor poster.